To make a crossing more sophisticated than a simple Zebra requires the addition of signals to control the traffic, and the rest of these pages chart the development of the signal-controlled crossing. Given that the Zebra emerged in 1953, and that reports of the introduction of various types of experimental signalised crossings in the 1960s (of which much more later) usually portray the public as being baffled by all the new technology, you could be forgiven for thinking they were a post-war invention. Not so. The very first signalised crossings in Britain were introduced by Manchester-based Forest City Ltd. in 1929, and were immediately recognisable as a pedestrian crossing to modern eyes. They consisted simply of a regular traffic signal on each side of the road, with a push button for pedestrians. When the button was pressed the lights changed to red for a set time, and then returned to green. A timer ensured that traffic would not be interrupted for a certain interval afterwards. Perhaps equally remarkable is that the first set of automatic traffic signals had only been installed in Wolverhampton in November 1927, meaning that in less than two years, the concept of red-amber-green signals had become obvious enough to the motorist that Forest City's marketing need not explain any part of the traffic signal itself. The whole setup, they claimed, could be manufactured and installed for the towering sum of £65. Forest City's plans for the crossing involved painting two parallel lines across the road to mark the crossing place — "Pedestrian Safety Zone Lines" to be precise — and marking another line further back along with the word "STOP" to keep waiting traffic a cautious 20 feet from the crossing. If £65 was too steep, the 1920s traffic engineer could opt for a two-light system, with only red and green, or even a one-light system, with just a red 'stop' light that lit up when the button was pressed, the latter being a much more reasonable £45. It wasn't long before the design was modified to include signals for pedestrians too, though at first these were simply another set of red, amber and green lights facing the pavement. At the time, with no established convention, the amber light always appeared simultaneously with either the red or green light instead of on its own. Forest City marketing brochure explaining the different signals available. Click to enlarge. 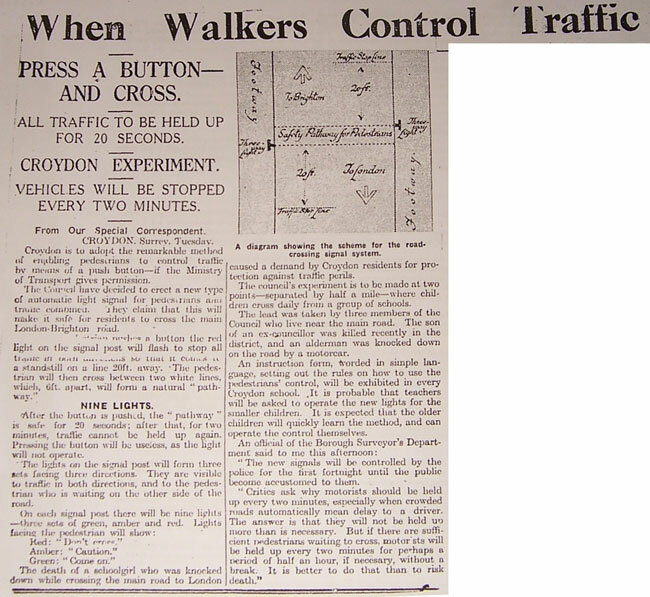 "Croydon is to adopt the remarkable method of enabling pedestrians to control traffic by means of a push button... The Council have decided to erect a new type of automatic light signal for pedestrians and traffic combined. They claim that this will make it safe for residents to cross the main London-Brighton road. "When a pedestrian pushes a button the red light on the signal post will flash to stop all traffic in both directions so that it comes to a standstill on a line 20ft. away. "An official of the Borough Surveyor's Department said to me this afternoon: 'The new signals will be controlled by the police for the first fortnight until the public become accustomed to them.'" Croydon was sufficiently pleased with them to install another crossing closer to the town centre on North End soon afterwards. By the mid-1930s there were quite a few sets around London and presumably in other cities too. Forest City had updated its designs again — despite being denied a patent — so that pedestrians were now given white "DON'T CROSS" and "CROSS NOW" lights, with a Belisha Beacon posted on top of the traffic signals. This futuristic piece of technology now marketed for £85-120. By this time, the Ministry of Transport considered that signalised pedestrian crossings were safely out of the 'experimental' stage. It was only then that any official guidance was provided on them — they were, after all, just a product manufactured by one company which was being installed by local authorities. The guidance, however, was simply that they should be fitted with "Please Cross Here" signs as used at other safe places to cross the road. "Apart from the fact that these people are excitable and ill-disciplined, the printing of instructions on the controller would present a problem since, even if these were printed in Yiddish and Russian, it is possible that a number of persons using the apparatus would not be able to read even their native language." Despite a fair number of crossings appearing in the 1930s, there's little evidence of enthusiasm from the authorities. In fact, most of the ideas for crossing places seem to have come from Forest City themselves, shamelessly sending letters to councils and the Ministry of Transport, such as one in the early 1930s which suggests that a high accident rate on "Weston Avenue" could be solved using traffic signals. In that particular case the Ministry decided to install footbridges instead, which just goes to show that flattery will get you nowhere in government. The UK has been driving in circles for a hundred years now, and this humble road junction has become part of British culture. Just what is so special about roundabouts?